We’ve recently been asked on a number of occasions for quotations for moving to Brazil and Uruguay, and we’ve been a bit shocked by some of our competitors who have given clients very cheap door to door rates, but failed to include all of the port charges that clients will definitely incur on the South American side. Brazilian ports have been wracked with problems of efficiency and bureaucracy for many years, the harbors are not deep enough due to silting of newer highly efficient larger vessels, the ports are poorly designed causing bottlenecks to access cargo container terminals, and in many cases the rail network and roads in the vicinity of the ports are insufficient. All of this makes everything more expensive and slow at Brazilian ports and creates extensive congestion at sea, in fact every ship that arrives in the country waits at least 5.5 days to have the containers unloaded, the world’s average is three days, and in ports like Hong Kong and Singapore the unload is measured in hours rather than days. 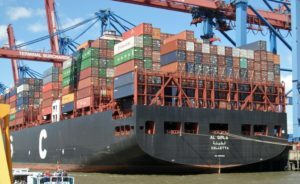 Compounding the problems at Brazilian ports is the fact that the customs clearance operation only works normal business hours, and it is in fact one of the only country among the world’s major economies, which does not have these services available 24 hours. There are also serious issues relating to the workforce conflicts, the work schedules which are invariably incorrect, and the conditions of work. As a result there are frequent strikes and slow-downs. In short, containers can in some cases take many weeks before they can be collected from the port, and during these weeks the container incur a variety of additional charges such as demurrage, port storage, and late container return penalties, which all must be paid by the ultimate owner of the consignment before the container is released. During a good period the consignment may progress through the system quickly and therefor the additional charges may be only $100 or $200, however during a bad period the charges can quickly escalate to $2,000 or even $3,000!! !